George Osborne has been building up to this week’s festival of reaction with an interview on the Today programme. (It’ll be on i-Player later on; for now, there’s a good precis on Andrew Sparrow’s politics live blog). It looks as though they are getting ready for even more cuts in Housing Benefit: the Chancellor said it isn’t fair that some young people with jobs can’t afford a place of their own while others can go on the dole and get Housing Benefit. The first mistake is the belief that Housing Benefit is only for people on the dole. In fact, it is a benefit for people whose incomes are too low to pay their rent, whatever their working status. There are more than a million and a quarter people over 65 who get HB – 25.6 per cent of the total. Another 135,000 (2.7 per cent) are women aged 60 to 64, most of whom will be over state pension age. It isn’t just unemployed people who are at risk from an attack on HB – below-inflation pay increases and rising numbers of people in involuntary part-time jobs are forcing more and more people in work onto this benefit. The second mistake is to imagine that it is easy for young unemployed people to get Housing Benefit to pay their rent. There are special rules for people under 35 (25 till this year) that mean that they get a lower rate of benefit. Young people under 25 only account for 7.6 per cent of Housing Benefit recipients and a majority of young people on HB (53.3 per cent) have children – I do hope the government isn’t planning to make it impossible for them to pay their rents. Just 2.4 per cent of under-25s are receiving Housing Benefit and don’t have children. That’s 180,000 people; there can be a hundred good reasons for this – they may be care leavers, they may have been thrown out of their parents’ homes or left unbearable situations, they may be young women fleeing domestic violence, they may have got their flat when they had a job but then been made redundant. The assumption that Housing Benefit is a special perk for unemployed people is wrong. 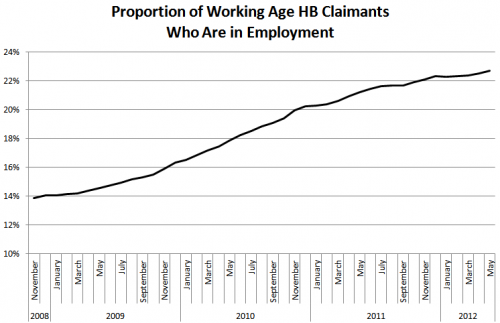 So is the notion that young people getting HB are ne’er do wells. I’m worried that we’re gearing up for a repeat of what happened in the 1980s, when the Fowler reforms took away 16 and 17 year olds’ independent rights to benefit. It’s a quarter of a century ago, so some readers may not realise that, before those reforms, you almost never saw young people begging or sleeping in the streets. Those of us who campaigned against the 1986 Social Security Act repeatedly warned that it would force 16 and 17 year-olds into destitution. This was simply ignored by the government of the day, backed up by the same sort of media campaign that we’re seeing now. The Act came into effect in 1988, and within a year there were young people sleeping in shop doorways. I fear we’re on the verge of repeating that mistake. Is the issue the existence of housing benefit or the level it is set at? For me it seems like its set too high. And I just don’t accept the avoiding ghettos argument or local roots as reasons to provide HB for people to live in RBkC or LBHF or Westminister (with some discretion for special situations like disability). Good post – we’ve calculated the impact in Camden – which stands much of this up. Hb is also paid to the landlord, so it’s not like young people ‘see’ all of these high benefits in places like London. You are right – the individual levels of housing benefit are high (at least for people in the private rented sector). But the key question should be more around why they are so high. It is because rents are high – caused by, among other things, the lack of regulation in the banking sector which meant buy-to-let mortgages were handed out to anyone. Another big factor was right to buy for social housing, which has never been replaced. The government needs to stop trying to blame the size of the dole queue on the people in it. c) Introduce al least some controls of rent in the private sector. Thank you for this interesting article, although have you not also considered that housing benefit is a reason that people are increasingly unable to afford to rent property without government support (i.e. housing benefit is a subsidy to landlords, and has an inflationary affect on rents)? I would note that your graph alarmingly suggests this is the case. Have not also considered that if housing benefit was ended that market rents would inevitably have to adjust to levels which people could afford (properties with rents set too high would remain empty, therefore forcing landlords to reduce prices)? Surely then the untold truth regarding housing benefit is that far from helping ordinary people it is way for the government to channel their hard earned money toward landowners and simultaneously price them out of owning or renting property independently. The government are working on just that assumption – that there is a ‘vicious circle’ of housing benefit pushing up rental prices, thus pushing up the housing benefit bill, ad infinitum. The problem is it is just that – an assumption. They have not come up with any decent evidence to back that up. It would be a heck of a gamble to just pull away housing benefit and hope the rents come down (without even thinking of the inevitable short-term homelessness and social breakdown). It is likely that, yes, housing benefit is in itself a factor in pushing up rent. But only a factor. And this is another problem with the government’s thinking on welfare reforms – they are looking at in as a problem in isolation. They need to be thinking about this issues in a systemic and holistic way – joining up welfare reform with housing, employment, greater economic conditions, etc, etc. Until they do, we will keep getting these unintended (or a cynic may say intended) consequences where government policies are working against one another. The way I see it, we have massive government control of housing in the UK. This blog post mostly addresses demand factors. Plenty of supply factors as well such as planning laws etc. exist too. I’d advocate strongly for the government to exit the market altogether, implement just enough regulation for property and contractual rights to be secure for renters and owners and offer an income top up to those truly too poor to house themselves. I can probably only dream of this outcome. It is not the case in all areas of the country that housing benefit is too high. In many areas, people experience a rent shortfall often of £50-100 per month, that they must make up somehow. I am disabled and have been informed that HB will stop next year. In my area we have a rent cap for different areas, most of the Land lords wont accept DSS but still the price of renting has shot up,this cant be due to HB. I have to top up £100 a month from DLA, even if i go to a cheaper area the ratio is the same as my HB goes down in accordance with it, presuming i lose my DLA next year i will also lose my home, i have 13 yr old too. i need to stay here as my support network is here and family who do chores etc for me. i really do not see a way out of this mess for us other than living under a bridge. Actually HB is NOT always set too high – where I live there is a Local Housing Allowance which is a fixed rate for HB regardless of what tent is charged. For example, a landlord charges £600 a calendar month for a 3 bed house. The LHA states that all 3 beds in that area receive a max of £400 – that’s a big shortfall if you find yourself redundant/on the sick etc, which I did last year when I had cancer. So out of my sick pay (half of normal wages) I had to find the extra! 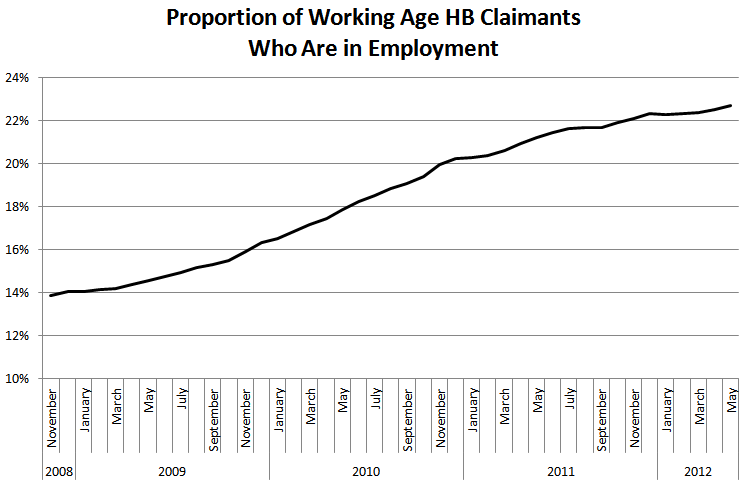 PLUS HB is calculated on a weekly rate multiplied by 52 weeks divided by 12, so there’s always some discrepancy!! I had to rely (and I am a proud hard working mother of 3 in a f/t job) on food parcels from friends and family whilst I had my cancer treatments because all my sick pay and child benefit went on paying my rent & bills. There were no discretionary payments due to my illness. Partly because my symptoms were due to the TREATMENT for my cancer, not necessarily the cancer itself. Nice move eh? I also work for a charity that supports vulnerable youngsters, vulnerable families and victims of domestic abuse, and I am in fear of what lies ahead for us all. Tighten your belts and buckle up guys & gals, we’re in for a rough ride!! Whinge to support general argument: i came back to London from studying abroad on an exchange during the summer in Augst 2007 and i couldn’t find a single place to live i could afford for my third year of university, yet that was no problem the previous year – i ended up having the year from hell moving from dodgy illegal lodging to dodgy illegal overpriced lodging and nearly failed from the depression it gave me, but i did conduct my own research comparing identical rented room searches on gumtree with the previous year, and later read from the year-end statistics that i was quite right: i calculated rents had doubled in inner london for bedsits in that year, the figures claimed tripled. This goes to show that rent skyrocketing is unrelated to housing benefit, as 2007 was boom-time, at least in london. All the landlords put in free Sky TV and re-advertised their properties as ‘luxury’ and everyone else moved to zone 5 (=2-3 hour bus commute each way to work). I moved to Wales, which is heaven, but ended my career. Win some lose some. Interesting article, I fall under the 2.4 % of young people under 25 without children. After enduring an abusive relationship with an alcoholic mother I naively assumed anyone would give a cahoots about me. I was told because I had no mental health issues, no medical issues or any small children I did not meet the criteria for social housing. Freshly out of uni with the job market a shambles I had to resort to jsa just to get by. According to their guidelines anyone under 35 will only qualify for shared housing i.e a room in a house or flat shared by 3-4 other people. The rates HB would pay were capped at £80 p/w and as if that didn’t limit you enough, you had people being picky insisting you had to be a certain ethnicity or vegetarion or religion to live with them. Did it stop there? Oh no. After filtering through all the criterias you didn’t fit you had to face another slap in the face, most would recognised as three little words NO DSS welcome. Good luck to anyone with their back against the wall, you’ll need it. Once all the disabled people in the UK are killed off by government policy the country will be awash with money. Those naughty disabled people who caused this economic mess in the first place appear to warrant all the hate and bile and injustice being thrown at them. Nobody is standing up for them. 73 disabled people are dying each week (DWP figures). Iain Duncan Smith must be a proud man tonight knowing the death figures have ‘shot up’ from 32 to 73 in just a few weeks. This country is putrid. It has no morality and no sense of social justice. I do wonder if anybody notes the comments made here. There is never any evidence that that is so though. Maybe everyone is too busy coming up with the next appraisal that commenters views, whilst accepted, are of very little import. There is definitely no sense of engagement – rather like the tory conference actually – expected to turn up and applaud and then bugger off again. Great this demcracy thing isn’t it???? I totally agree with all you say. The difficulty is that the government are using classic ‘divide and conquer’ tactics and inciting discrimination amongst those working and those not,the public are responding due to ignorance. The fact is all people can add their name to a council housing list. All applicants are assessed according to needs. Believe me i have a disabled son who is priority in which the council have ignored his homelessness since april 2011 it now Oct 2012. I think it needs someone to publically address the conservatives each time they refer to an unfair system of those in a council place and those working. It also needs to be mentioned that run down council house rents were being increased equivalent to the private sector, so what is the problem of those who are privately renting. They did have the chance to wait on a council list but didnt, their rents are higher but council houses are run down , they are likely to be living in much newer accomodation. At the end of the day those renting privately did have same chance as all of us to go on council list , and they shouldnt be resentful as no one gets one unless they are in absolutely dire circumstances. If they dont like their private rent then blame the government as they should be capping private renting just as they said they were increasing council rents to aline them with private renting.I saw this same argument brought up on ‘question time’ tonight, how frustrating it was that no one was able to correct this inaccuracy which is causing so much anger with those who rent privately. The fact is you may work , you may rent privately but understand council houses have to be waited for for years unless you are extremely vulnerable (even then they dont respond unless you address it legally like my sons circumstances) i hope someone will pull up the conservatives next time they use this example of divide and conquer, they should be pulled up on the law of ‘inciting discrimination’ because that is exactly what they are doing! one last comment. i am appalled at what this government are doing to the under 25s, this is completely unacceptable and i am now beginning to believe we have got nazis ruling our country, who would do this. I think people reading this post should recognise the real problem is due to our government joining europe without us knowing. we are a small country and all the people coming into our country due to signing up to europe is bleeding our employment housing nhs and social security benefits dry. Go to the daily express Europe campaign and sign their referendum on europe petition, as the government really dont want do address this issue but it is the real reason why we are all having drastic cuts in benefits,housing etc. This is why the conservatives are attacking the people in this country and making cuts because cameron dont want to address the real issue. vote for a referendum on europe! Who Are the Doctors Practicing Environmental Medicine?